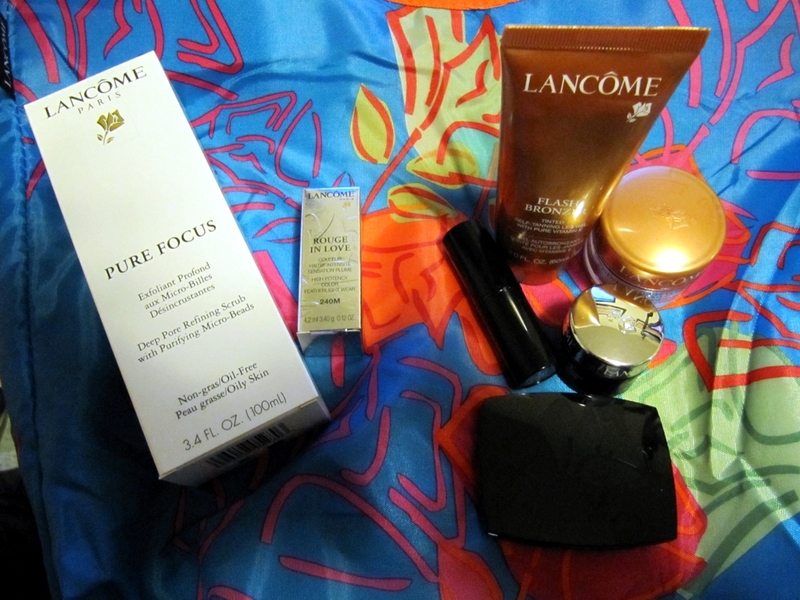 So I had never been to a Lancome counter before and although I’d heard good things….there are so many options and alternatives out there, it just never became a priority for me to try. Or at least that was the case until about a week ago and my husband and I were in the mall and I stumbled my way into Sears. I’m such a sucker for “Gift With Purchase” promotions and I’m all for the so-called “free” product. For this promotion you needed to spend $45 before tax and you would receive a customized kit with varying products. They also happened to have a makeup artist on site that day and offered a full makeup trial at no charge so I could see what sorts of product I might be interested in. I’m all for trying new things, so away we went. When choosing colors for a look, I gravitated towards the Emerald Boudoir eye palette. The color scheme didn’t strike me as typical and even though I have all of those shades of shadows at home I never would’ve thought to put them together…so I was eager to see what it would look like. I ended up really loving the combination of the peach and the green together. It was soft and subtle because of the neutral browns but still had pops of color to make it a bit more exciting. What do you think? In order to get the “free gift” I purchased two items. The first item I purchased was the lipstick from the make-over look above. It is from Lancome’s “Rouge in Love” collection – shade 240M (Rose En Deshabille). 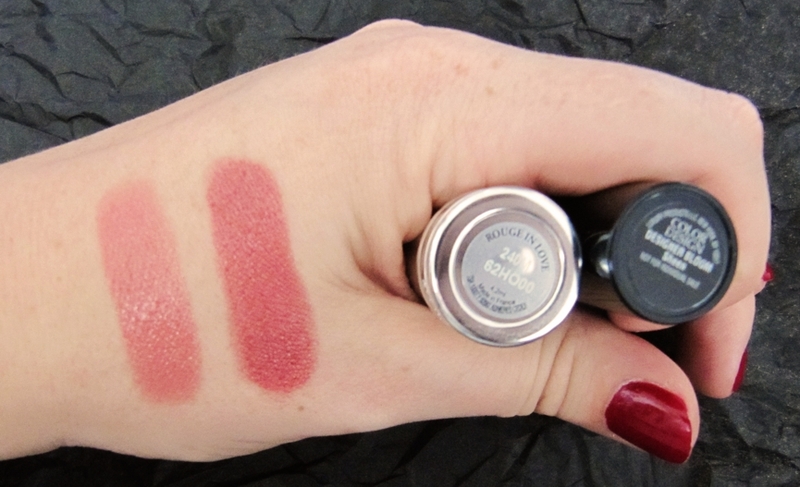 This collection of lipsticks boasts high potency color, 6 hour wear and a featherlight feel. This shade in particular is a very soft and subtle pink that I see myself getting a lot of use out of. The second being “Pure Focus exfoliator“, an oil free deep pore refining scrub with micro beads. To be used only 2-3 times a week Pure Focus unclogs and tightens pores while leaving your skin soft and matte. I have been using it for a week now and so far I absolutely love the feel of this scrub! When it came time to checkout we started the process of putting together the GWP. Every customer gets a good sized sample of the Flash Bronzer. At 60ml this is just under half the size of the full sized version available for purchase at $38.00 CAD. Flash Bronzer is a tinted self tanning leg gel with pure vitamin E. I haven’t tried it yet out of fear of ending up orange or streaky, but a fellow beauty blogger gave me the best tip. She said to mix it with lotion so the pigment isn’t so strong and apply it to your leg that way for a more natural look. Thanks Rebecca! Now I am actually looking forward to trying it. You had a choice of two eye creams. 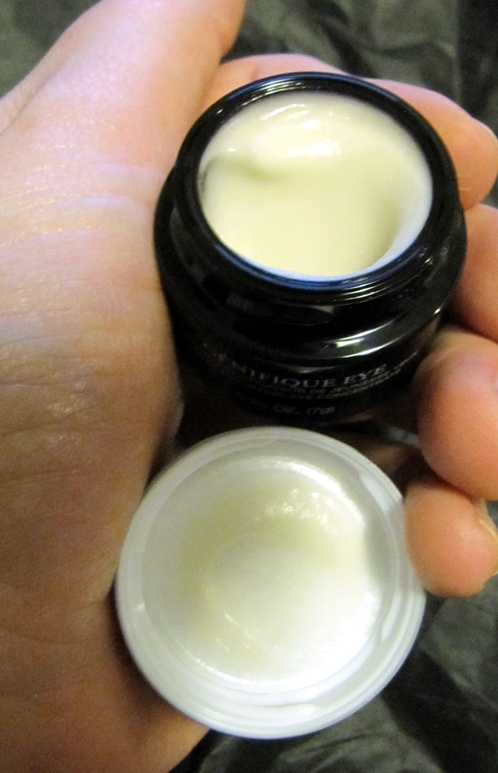 I got the Genifique Eye Cream , a youth activating eye concentrate to be patted daily over the brow bone and under eye area. At 7g, this is also just under half the size of the full sized version, which is available for purchase at $80.00 CAD. You also had a choice of two face creams. I got the Bienfait Multi-Vital SPF 30 Sunscreen, a high potency daily moisurizing cream that is enriched with vitamins. This sample is 15g, about one-third the size of the full sized version, which is available for purchase at $58.00 CAD. For the cosmetic side of things, you could choose between a mascara/makeup remover or an eyeshadow palette (all sample size). I opted for the set of 4 eyeshadows. And last but not least, for lips, you could choose between a lipstick or a juicy tube. I grabbed a lipstick “Designer Bloom”, with a sheen finish. You can see it here, swatched next to my 240M shade that I purchased. Each gift was also made complete with a spring colored reversible tote-bag that all of your items were neatly tucked away in when you left. 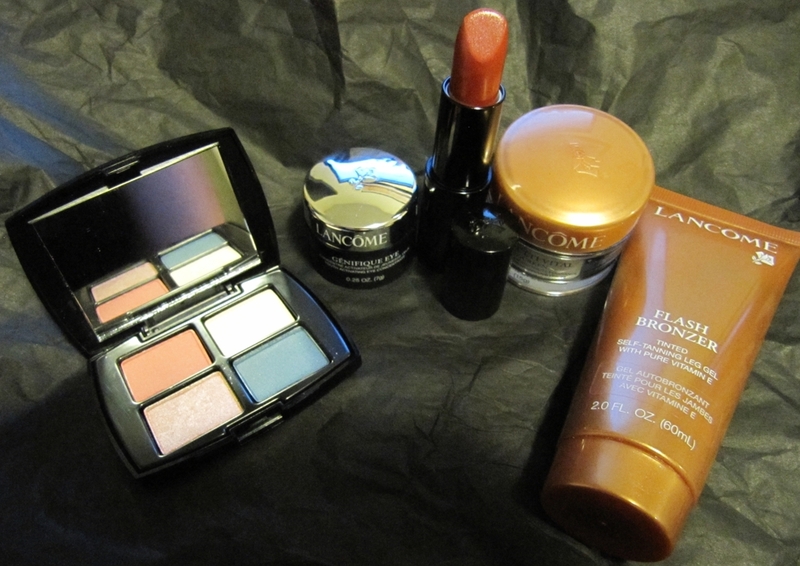 Given the value of this gift with purchase, I couldn’t have been happier with my Lancome haul. Out of the products I have tried so far, there have been no disappointments at all and I look forward to trying the rest. And even though I don’t believe Sears still has the Gift with Purchase event on for Lancome anymore…their website www.lancome.ca has a promotion right now that is similar. (Spend $50.00 and get a sample gift valued at $129.00, for complete details, please click here.) Be sure to enter the promo code RADIANCE upon check out to take advantage of this great offer. Are you a big Lancome addict? What is your favourite product from them that you can’t live without? This entry was posted on June 12, 2012 by Shannon @ Eyemasq. It was filed under All Other Swatches, Looks, Makeup, Reviews and was tagged with 240M Rouge in Lipstick, Bienfait Multi-Vital, Designer Bloom, Emerald Boudoir eye palette, Flash Bronzer, Genifique Eye cream, Lancome, Lancome eyeshadow palette, Lancome Gift with Purchase, Lancome GWP, Lancome Promotion, make-over at Lancome counter, Pure Focus Exfoliator, Rose En Deshabille lipstick swatch, Rouge in Love, Rouge in Love Lipsticks. Great Haul! I love the lipsticks that you picked, they are great everyday shades, but could easily double as a night out! Thanks! They seem to me like very useful shades…as opposed to those “more fun” ones that you almost never wear. 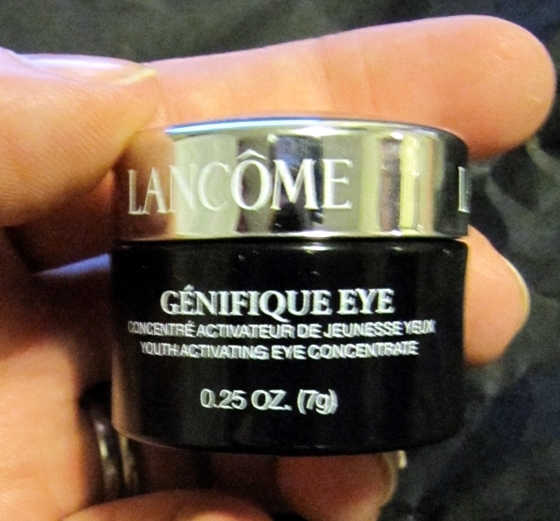 Lancome does sort of have that “mature cosmetics” stigma, but I’ve got to say, they had a lot of fantastic products I was interested in, but they are most certainly not on the inexpensive side. In my opinion, a gift with purchase, like this promotion is the best way to try a new brand so you can sample a wide variety of products without going broke! Which one do you use Ash? Hey, I love that you tried Lancome. I’ve never thought of it as a “mature” woman’s cosmetic line. I suppose that has something to do with the fact that I’ve been wearing it since I was 18. I’m a Lancome whore. I have almost everything. I hope you love the Rouge in Love lipstick. As I was putting one of mine on this afternoon, I thought of you. 🙂 Thanks also for the link to my blog. That’s so sweet of you. Enjoy the GWP, that’s the best part! 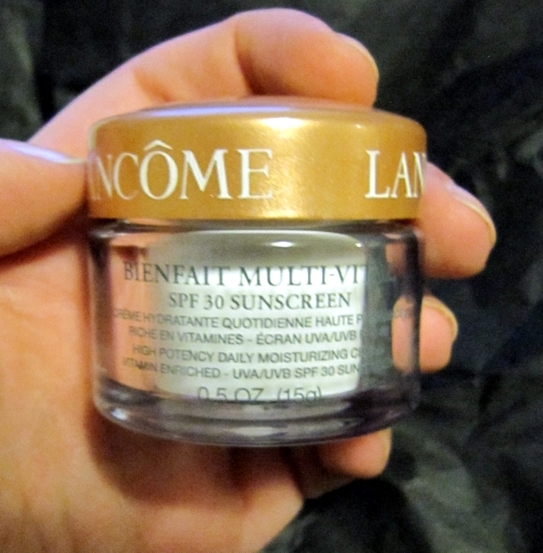 I’m glad I gave Lancome a try too – it was about time! From the sounds of it, you must have multiple products that you can’t live without. Any absolute must-haves that you want to give a shout out to?? That’s so cool Amanda, thanks for sharing your Lancome experiences! This might be my first Lancome experience, but certainly not my last. I think I will now group them with Clinique, where I buy something everytime they have a GWP program…that way I constantly get to try new things wtihout going broke! Do you use much of their skincare products, or just cosmetics? 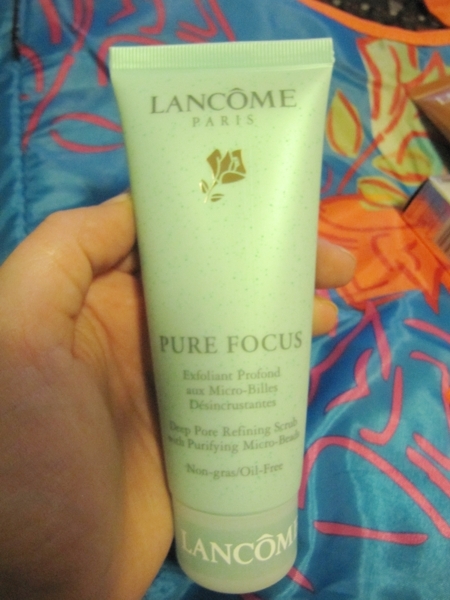 I’m absolutely loving the Pure Focus exfoliating scrub ever since I’ve got it. I’ve noticed such a difference already and it’s only been 10 days! I guess the true test will be whether or not I still love it after a month! I find my skin changes a lot too, even from season to season. I seem to really love something at the beginning of a bottle/tube and by the end of the bottle I’m not so crazy about it. It’s almost like my body works up an immunity and needs a change. Does that sound crazy? Because I’ve always felt that my hair is the same way. I need to change from brand to brand when I run out to keep my hair happy. Absolutely not crazy! I feel same way! I’m glad to hear you go through the same thing. I wasn’t sure if it was just me! As for make up, I love the Lipsticks. You just picked up a Rouge in Love. If you hadn’t, that would’ve been a shout out for me. I have 4, and I love them. My all time favorite Lancome Lipstick is a L’Absolu Nu in Chiffon Red. It’s creamy and sheer. I don’t even need a mirror to apply it. I’ve also been loving their serums. I have both the Genifique and Visionnaire. I really hate the price I pay for them, but I love what they do for my skin. I have more radiance, better overall texture, and my fine lines are smoothed out. I do use lots of their other products, but these are my favorites. Very cool! When I got home and checked out my haul, I was sure I was going to take that Rouge in Love Lipstick back. I kept thinking…$30, my god, no lipstick is worth $30. Honestly, I don’t even know how I left the counter having paid that, I think I was mostly excited about my “free” stuff and my new scrub. But I decided to try it out…worst case I can still take it back, but at least now I won’t be wondering about it. 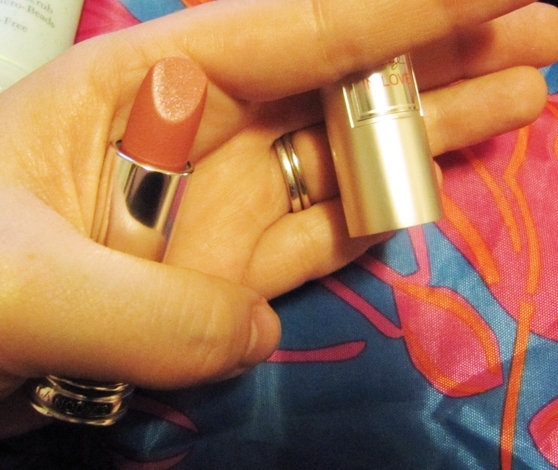 So far I’ve been liking it a lot…but to be honest, I like most lipsticks. I’m not sure about the extra $10 I pay for this lipstick, opposed to other high-end lipsticks. What would you say sets the Rouge in Love lipsticks apart? Most long lasting lipsticks are dry and matte. I like that the Rouge in Love lipsticks don’t go on that way. They’re creamy, and have some shine to them without needing a gloss over top. They also have lots of pigment. Of course, if it’s the price you object to, my favorite high-end lipsticks are Clinique because they aren’t too pricey. I just got a Pudgy Peony Chubby yesterday. It’s one of their new colors in the Chubby line. I LOVE it. I can’t wait to try the Clinique Chubby sticks. I have one from Tarte that I really enjoy…I’m also looking forward to seeing how the Revlon ones are. 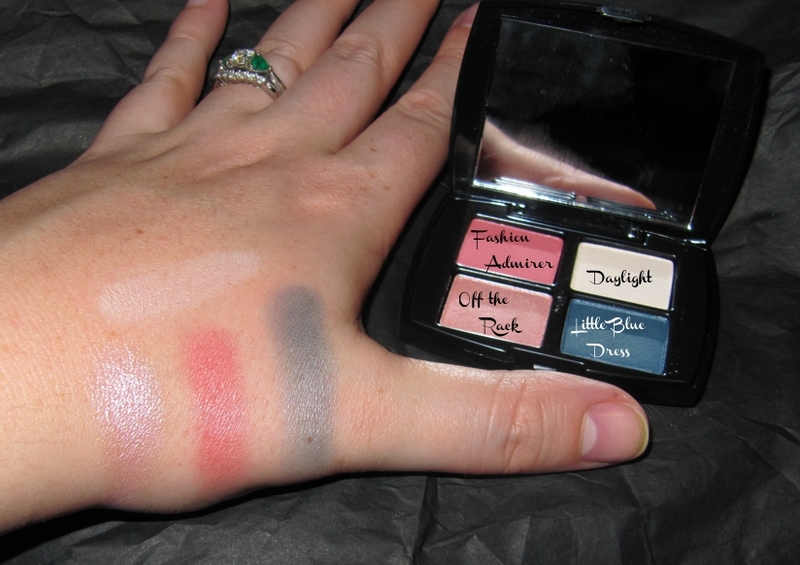 And as for the Rouge in Love, it’s not that I think they aren’t awesome…I do really like the one I have. But I just feel like you can get other wonderful lipsticks in the $18-$24 range and that I’m not sure I see the extra value to rationalize paying $30. So we’ll see! It is easy to sell a person one of something, but the true test is if that person will ever buy it again. You have four of them, so that says a lot! Thanks! I really loved the look of green and peach together. It’s such a unique combination. I haven’t seen it on anyone and never would’ve thought to put them together, but now I am thinking about all the shades I can put peach with. Let the fun begin! Remember Shannon, I’m a Lancome whore. My local department store only has 4 cosmetic counters. Clinique, Estee Lauder, Elizabeth Arden and Lancome. The rest of my makeup I have to order online, or pick up at the drugstore. I really don’t like to buy things I’ve never tried before, or had a chance to see with my own eyes. I’d give my right arm for a MAC counter. (or Benefit, Bobbi Brown, Chanel, bare minerals, Origins, Shiseido, Nars, Dior, or Laura Mercier) I don’t have a Sephora or an Ulta either. I live in a very rural part of the Pacific Northwest. As for the Revlon Chubby Sticks, they’re nice, but not at the top of my list. I’d pick up a Revlon Butter Shine first. I guess your locale and what you can have at your fingertips will make a huge difference on what products you end up with. I’m the same and I like to be able to touch and feel and see things in store. I’m sure I wouldn’t have as much stuff from Sephora and MAC as I do, if there weren’t several in the Ottawa area. I would kill for a Sephora. Well, not kill. But you know. Right? It’s funny, because I was a MAC girl for so long and never ever got anything in Sephora…and then it started with just one thing….and I was hooked. Now there are a gazillion things I want from there and I still love MAC. All that’s happened is my addiction has become more widespread. That’s how it goes. They lure you in with one thing. Then you’re hooked. I’m on the website 4 to 5 times a week. Sometimes more. Often times it’s for reference or research for my blog, but still. The more time I spend there, the more likely I am to make a purchase. If it makes you feel better, we don’t have Ulta in Canada…and I just looked it up. I’m super jealous that such a place exists. We can both be sad about that one. It seems like a place I would spend a lot of money. 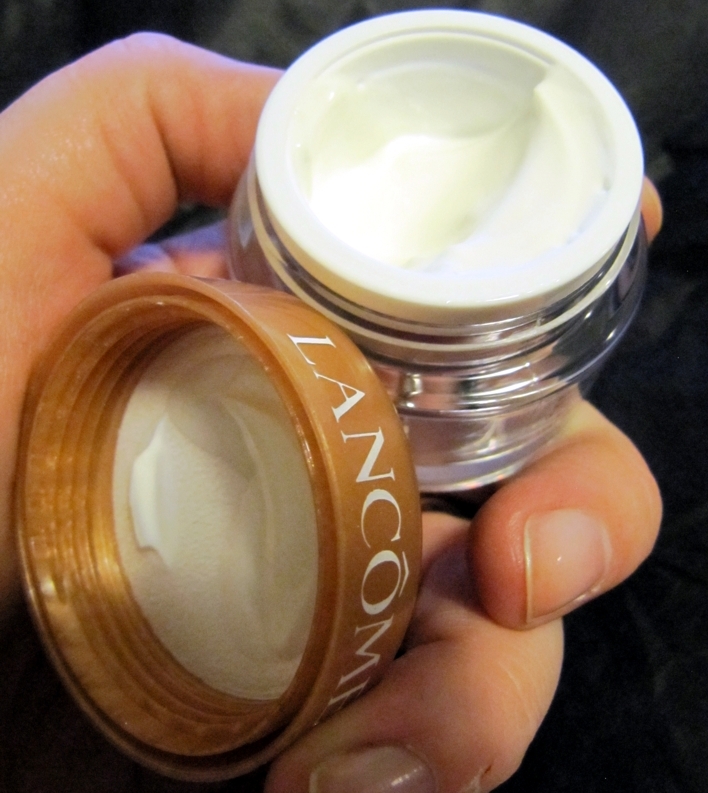 I think I default to Lancome because it’s the best option I have. When I get to a big city like Seattle, WA or Portland, OR or Boise, ID I always stop at a Sephora and a big department store. I browse and drool. I also have started to make lists of things that would be good for me to pick up when I “need” need something new.